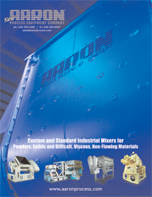 Aaron Process offers a complete line of Sigma Blade Mixers, Mixer Extruders, Plow Mixers, FDA approved Sanitary Ribbon Blenders, Planetary Mixers and a Laboratory style mixers. All our mixers are available in many sizes and available with standard design features and upgradeable options. Aaron Process Equipment Company is backed by their commitment to service and one of the longest warranties in the industry.